Mohammad Rafique helped Bangladesh give a rare fighting display as South Africa scored 264 for six on the opening day of the second Test at the Bangabandhu National Stadium here today. Bangladesh bowler Mohammad Rafique (R) and wicketkeeper Mohammad Salim (L) appeal for LBW in vain against Shaun Pollock (C) of South Africa on the first day of the second Test in Dhaka on Thursday. Justin Langer was dropped twice on his way to his 18th Test half-century as Australia rattled along to 113 for one at lunch after being sent into bat in the third Test against the West Indies here today. Cricket Bible Wisden has devoted special space to Sachin Tendulkar in its latest issue, eulogising the Indian batting genius for being “miles ahead” of his contemporaries and continuing to “write an elegant, belligerent and unprecedented history”. It appears straight out of a Bollywood movie, with the bride-to-be running from one train car to another to avoid the “villains”. Zimbabwe’s cricket chief tried to persuade Andy Flower not to retire after this year’s World Cup and denied suggestions that the team’s former leading player had faced the sack over human rights protests. 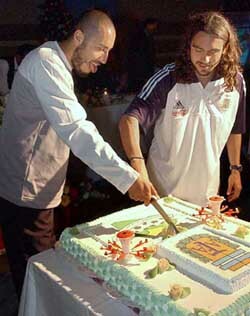 Libyan Football Federation vice-president al-Saadi Gadhafi and son of Libyan leader Moammar Gadhafi, left, and Argentina's captain Juan Pablo Sorin cut a jumbo-size cake bearing the logo of their teams during a reception after an exhibition soccer match between Libya and Argentina in Tripoli on Wednesday. Argentina beat Libya 3-1. India has begun preparations for next year’s Athens Olympics in right earnest and national coach Rajinder Singh believes that the Asian style of attacking hockey will be the key to success. The 2002 World Cup co-hosts Japan got off to a winning start beating Myanmar 3-0 today in the first leg of the Asian qualifiers second round tie for the Athens Olympic Games next year. The US Olympic Committee (USOC) has welcomed a decision by the ruling body of athletics that it had acted properly in 1988 by allowing several athletes who tested positive for banned substances to compete. Thailand’s Danai Udomchoke packed off top seed John Van Lottum while second seed Gregory Carraz stayed on course for the title after the quarterfinal stage of the $25,000 Indian Oil Servo ATP Challenger tennis tournament here today. World chess champion Viswanathan Anand and Commonwealth Games triple gold medallist Anjali Bhagwat were adjudged the best male and female sportspersons, respectively, for the year 2002 by the Hero Indian Sports Academy. The Academy conferred 14 other awards in different categories at a glittering ceremony here last night. The Indian Olympic Association (IOA) might have announced the names of 21 athletes who had tested positive for banned substances at the National Games held at Hyderabad last December and taken appropriate action against them, but it has erred on at least two counts. Manoj Prabhakar, the man who famously blew the lid off the match-fixing scandal in cricket before himself getting embroiled in it, continues to be dogged by controversy with his estranged wife today accusing him of “torturing” her “in collusion with a failed bollywood actress”. In the opening match of the Ist Major Jagpal Memorial Junior Inter-Public School Basketball Tournament for boys and girls, the hosts, Pinegrove School lost a keenly contested match to Lawrence School, Sanawar, by 5 points. Hosts Haryana made an impressive beginning when they downed Jharkhand by 82 runs in a match of the four-day Junior National Women’s (under-19) Cricket Championship that was inaugurated by the Haryana Governor, Babu Parmanand, at the new cricket stadium in Chaudhary Devi Lal Sports Complex of Panchkula. The 53rd Punjab State Basketball Championship for junior boys and girls will played from May 2 to May 5 here. Mohammad Rafique helped Bangladesh give a rare fighting display as South Africa scored 264 for six on the opening day of the second Test at the Bangabandhu National Stadium here today. The 32-year-old left-arm spinner took four for 59 as Bangladesh looked to redeem itself after going down by an innings and 60 runs in the first Test, their 17th loss in 18 matches since gaining Test status. 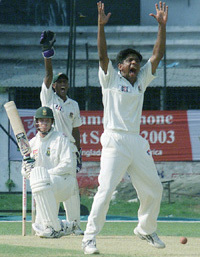 Rafique, whose best in two previous matches was three for 117 against India in Bangladesh’s inaugural Test at the same ground in November 2000, spun a web on a slow pitch with low bounce. He took the important wickets of Herschelle Gibbs, Boeta Dippenaar, Neil McKenzie and Mark Boucher as the visitors struggled after electing to bat. Rafique, brought in for Manjural Islam, put Bangladesh in the game after seamer Tapash Baisya got the initial breakthrough by dismissing captain Graeme Smith. Rafique’s first victim was Gibbs, who succumbed under pressure as seamer Khaled Mahmud bowled a miserly spell from one end and the left-arm spinner tormented the batsmen from the other, varying both trajectory and speed. Gibbs was caught at mid-on in a desperate attempt to break the shackles after an uncharacteristic 21 off 65 balls and Dippenaar followed soon after, caught bat-pad at silly point. McKenzie was trapped leg-before wicket early in the second session and then Rafique came back to castle Boucher, who was shaping for a square-drive off the backfoot. South Africa was lent respectability by Jacques Rudolph and Mark Boucher, who scored 71 apiece and were involved in a 107-run stand for the fifth wicket when the team was struggling at 63 for four. Rudolph, who scored an unbeaten 222 for a rare double-century on debut in the first Test in Chittagong, hit 11 fours in his 138-ball essay. Boucher, who was lucky to survive a chance on eight when wicketkeeper Mohammad Salim failed to stump him off leg-spinner Mohammad Ashraful, faced 134 balls and hit eight boundaries. It was the wicketkeeper-batsman’s 13th half-century in 60 Tests, apart from three hundreds. Former captain Shaun Pollock supplemented their effort with an unbeaten 41, having put on 45 runs for the unbroken seventh-wicket with debutant Robin Peterson (15). Bangladesh had the upper hand before the partnership between Rudolph and Boucher as they came close to taking wickets on several other occasions. Gibbs was lucky to survive an appeal for being caught behind off paceman Mashrafi bin Murtaza, umpire Brent Bowden declaring him not out when the ball seemed to come off his gloves. South Africa opted for two spinners, capping left-armer Peterson at the expense of paceman Charl Willoughby. Paul Adams is the other slow bowler in the side. Langer was dropped on the first ball of the match and again on four to be unbeaten on 53 as Australia lost just the wicket of Matthew Hayden in the first session at the Kensington Oval. At lunch, Ricky Ponting, who scored 206 in the second Test in Trinidad, was sailing along at 32 not out. 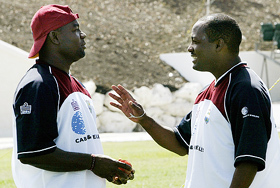 West Indies captain Brian Lara won the toss and gambled by sending Australia into bat on a flat hard pitch and fielding a vastly inexperienced bowling attack. The West Indies made five changes to their losing second Test team with 21-year-old fast bowlers Jermaine Lawson and debutant Tino Best coming into the attack to share the new ball with Vasbert Drakes. 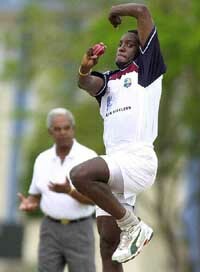 They left out their most experienced strike bowler Mervyn Dillon, while 20-year-old off-spinner Omari Banks made his Test debut. The four bowlers had a total of 11 Tests and 37 wickets against the experienced five-pronged Australian bowling attack which had a combined 195 Test appearances and 829 Test scalps. The inexperience was painfully exposed when Langer was dropped in a difficult diving chance by Ramnaresh Sarwan at third slip off Lawson’s first ball of the match. Lawson then fumbled a straight-forward return catch off his bowling when Langer was on four and Australia 24 without loss. “Sachin is now 30. But to the world, and to India in particular, he is still a boy wonder,” ‘Wisden Cricketers’ Almanack 2003 said in its separate write up on Tendulkar - “Batting for a Billion”. “Thirteen years and 105 Tests have passed since he first took guard at Karachi in November 1989, but the poet’s son with the almost-falsetto voice and the supremely dignified manner continues to write an elegant, belligerent and unprecedented history,” Rohit Brijnath said in the article. The write-up says though Tendulkar cannot be the greatest batsman ever in history, “in Tests and one-dayers together, the reality of international cricket today, Tendulkar will take some catching too”. “Tendulkar will never be the greatest batsman in history; that seat is taken. But as much as Donald Bradman’s Test average (99.94) outstrips Tendulkar’s (57.58), the gap diminishes substantially when other factors are taken into account. That’s what Indian cricketer Rahul Dravid’s fiancée Vijeta Pendharkar did on Wednesday to avoid the media when she arrived here for the Sunday wedding. Vijeta, a doctor from Nagpur, travelled in a first class air-conditioned train compartment that had curtains strung to avoid the shutterbugs. Photographers and television cameramen could only catch a glimpse of her running towards a car. Where the bride’s family is putting up has been kept a closely guarded secret. More so the venue of the wedding. Cricketers who have played with Dravid, called “the wall” for standing between the Indian team and defeat on many occasions, insist they are unaware. “It could be a temple wedding. The reception is at the Taj West End on Tuesday,” said one of them. The simple reception card simply says that Rahul Dravid cordially invites the guests for his wedding with Vijeta at a reception on May 6 at the Taj West End, said one of the invitees. It also, politely, insists on the card being carried for entry. The cricketer’s neighbours in upscale Indiranagar say the Dravid home was much more decorated for the brother’s wedding a couple of years ago. “It appears very low key,” said one neighbour, requesting anonymity. 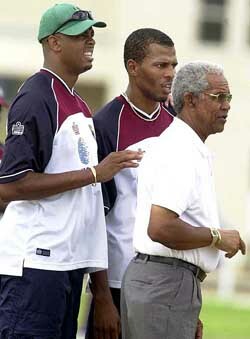 “There was a time, about two-three years ago, when the local barber was frequented by Dravid. They still have those photographs of his. The last few years have, however, been different. He is hardly seen in the area,” said another neighbour. The 29-year-old cricketer was not available for comment. Zimbabwe Cricket Union (ZCU) chairman Peter Chingoka, speaking at a news conference at Lord’s shortly after the squad’s arrival in England today, said he had wanted Flower to continue. 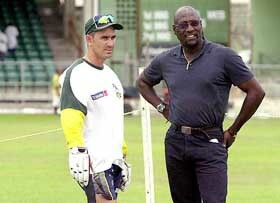 “We tried to hold on to Andy Flower, we offered him a two or three-year contract. That showed the goodwill on our part. A young and inexperienced Zimbabwe side arrived in England for a two-Test series and a triangular one-day tournament also involving South Africa. The 35-year-old Flower, a world-class batsman averaging more than 50 in Tests, protested with team mate Henry Olonga against alleged human rights abuses in Zimbabwe by wearing black armbands during the World Cup. More protests by activists against President Robert Mugabe’s government are expected during the current tour of England. Flower and Olonga retired from international cricket after the World Cup. Flower is playing for English county side Essex while Olonga, who refused to return to Zimbabwe citing fears for his safety, is also in England, on a short-term contract as a commentator. Chingoka added that Olonga, the first black cricketer to represent Zimbabwe, had also not been squeezed out of the team because of his stance. Olonga played in just two World Cup games, but Chingoka said he had been dropped because of poor form and the rapid emergence of all rounder Andy Blignaut. Zimbabwe captain Heath Streak said: “There have been voids left by experienced players who left us, like Andy Flower, but teams go through this phase of rebuilding. “We have a new-look side. It’s going to be tough for us. Hopefully we can rise to the occasion. Chingoka added that there was no ill-feeling between Zimbabwe and England following England’s decision to boycott their World Cup match in Harare earlier this year over security concerns. At one stage the issue appeared to threaten the current tour. “The matter is now history,” Chingoka said. The Indian probables kicked off today a month-long training camp for the double leg May 28 to June 8 invitational hockey tournament, involving India, Pakistan, Australia and Australia A at Perth and Sydney. “My main aim (at the camp) is to prepare and build a team for Olympics qualifying and Olympics,” Rajinder Singh, himself an Olympian, told PTI here in an interview. He said senior players — Mukesh Kumar, Baljeet Singh Dhillon, Baljit Singh Saini and Dhanraj Pillay — had been called to the camp to see if they could carry on till after the Olympic Games next year. The qualifiers would be held in Madrid next March. “They want to play more hockey and we have to give them a chance. 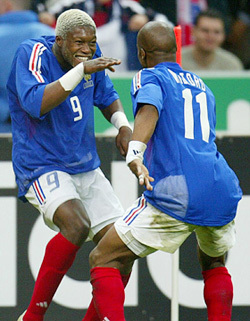 If they are able to play for the nation, we should welcome them,” he said of the seniors. “I will observe them for 15 to 20 days. I would like them to play at least one international match to see how they perform and also observe their fitness level. (Their) selection would be purely based on performance and fitness level. Age will not be a consideration at all,” Rajinder Singh added. Rajinder Singh said the reverses suffered by India prior to his taking over as coach about a year ago could be primarily attributed to the team adopting a European style of ‘mix’ approach and giving up the attacking Asian 5-3-2-1 format. “Earlier, we played a different style that does not suit Indian players,” he said but emphasised that for India to beat European teams, who are good at penalty corner conversions, goal-keeping and hit-and-run, it must adopt an attacking style. “That is the only way we can beat European teams. We cannot beat them by adopting European style,” the Indian coach said. Rajinder Singh, who was the coach of the Indian junior team which won the World Cup, said he was adopting the same recipe for success at the senior level by focusing on short-corner conversions, defending, goal-keeping and improving conversion rate of field goals. “In the Junior World Cup, we were getting goals only from short-corner conversions,” Rajinder Singh said adding “we are putting in a lot of effort on our weaker areas like goal keeping and conversion rate”. Another area of concern for the coach is the midfield, where he has only new players to depend on. It is this area that he would like to strengthen with seasoned campaigner Baljit Saini. Rajinder Singh said he would not be unduly worried by results of tournaments in Australia and Hamburg, where the team play a quadrangular tournament involving world champion Germany, Argentina and Spain in the last week of July, and indicated that he was looking at the bigger picture. India, the coach stressed, should not be too bothered by the outcome of these two tournaments, but must focus attention on the Champions Trophy in August and the Olympics. Rajinder Singh said the side’s efforts should be to emerge as a consistent performer and be among the top four teams in the next two to three years. India, the eight-time Olympic gold medallist, according to him, is slowly but surely on the path of entering the golden era again. It is just be a matter of some time before India regains that glory. Daisuke Matsui and Yoshito Okubo were on target, while second-half substitute Satoshi Nakayama, who netted an off- side goal in the 77th minute, completed the scoring in injury time. The Japanese, who received a first-round bye, controlled the match from the very outset, encamping in the Myanmar field for most of the time and never allowing the visitors to have a clear scoring chance. Only four minutes into the match, Matsui fired a sizzling shot, which hit the bar, and then the home side continued to threaten the Myanmar goal repeatedly. Aoki’s header two minutes later and Yuki Abe’s free kick from just outside the area in the 23rd minute went wide, while Myanmar goalkeeper Aung Aung Oo fell on the ground to save a lightning shot off Naohiro Ishikawa in the 38th. “This statement today completely supports our position,” USOC spokesman Darryl Seibel said by telephone from the organisation’s headquarters in Colorado Springs, Colorado yesterday. In Monte Carlo earlier in the day, the IAAF said it had been informed in 1988 that eight unnamed US athletes had tested positive but were still eligible to compete at that year’s Olympic Games because their cases were ruled “negative” according to the rules in place at the time. The allegations about the 1988 testing came to light after former USOC drug tsar Wade Exum released documents to a media outlet that he said proved athletes had tested positive for banned substances, but were not punished and allowed to compete. Seibel said it was a shame that Exum’s allegations ended up hurting several high profile athletes such as nine-time Olympic gold medallist Carl Lewis. Exum had hoped to have the documents introduced as evidence during trial in a lawsuit he filed against the USOC that claimed his programme was undermined and he was discriminated against at the USOC because he was black. But earlier this month, a federal judge in Denver dismissed Exum’s lawsuit, apparently prompting him to release the documents. There might not have been any Indian interest left in the event but there was no dearth of quality as the players, all ranked in the 200s and 100s, dished out the best of European tennis today. The day certainly belonged to an Asian. Udomchoke, ranked 249th and unseeded, showed the maturity in handling the crucial points while Lottum, of the Netherlands, buckled under pressure when the going got a bit tough for him and lost 6-3 5-7 0-6. Frenchman Carraz on the other hand was calm and collected in his 6-1 6-3 victory over Jonathan Erlich although the Israeli opponent, having come through three qualifying rounds, might have suffered a bit from fatigue. The Indian challenge evaporated as the last two doubles pairs Harsh Mankad and Vishal Uppal and Vijay Kannan and Ajay Ramaswami joined the casualty list in the quarterfinals. India was blanked out in the singles tournament even before the last eight stage as US-based NRI Prakash Amritraj, son of legendary Vijay Amritraj, lost to Swiss Yves Allegro yesterday. The winners for outstanding performance in their respective fields were B.C. Ramesh (kabaddi), Kunjarani Devi (weightlifting), Jyoti Randhawa (golf), Dhanraj Pillay (hockey), Bhaichung Bhutia (football), Pullela Gopichand (badminton), Mahesh Bhupathi (tennis), Geet Sethi (cue sports), Rahul Dravid (cricket), Neelam J. Singh (track and field) and Palwinder Singh Cheema (wrestling). The award for the best team performance went to the Indian women’s hockey squad which won the Manchester Commonweath Games. Shiv Kapur (golf) was awarded the best young male achiever and Koneru Humpy (chess) was selected the best young female achiever. In a noble gesture, the academy also presented cheques to the son of ailing twice world billiards champion Wilson Jones and the wife of late table tennis player Vilas Menon. The academy, which opened in February with the help of London-based Laureus World Sports Academy, had nominated four players in each category based on the voting done by members of the Sports Journalist Federation of India. The 20 Indian founder members of the academy then picked winners. The nominations for these awards have been conferred for outstanding performance in the respective field of sport for the calendar year between January 1 and December 31, 2002. Former India cricket captain Kapil Dev is the chairman of the academy and there are 19 other legendary sportspersons. Kapil is also one of 41 members of the Laureus World Sports Academy. Also present on the occasion were former England allrounder Ian Botham, a member of the Laureus academy, all the nominees and their families. Laureus, in association with Percept D’Mark of Mumbai, also launched the Laureus Sport for Good Foundation — India Project in February. Founded three years ago, Laureus is currently running 18 projects worldwide to bring about social change through sports. It also presents annual awards to the world’s top sportspersons in different categories in Monte Carlo every year. The Indian Olympic Association (IOA) might have announced the names of 21 athletes who had tested positive for banned substances at the National Games held at Hyderabad last December and taken appropriate action against them, but it has erred on at least two counts. By not taking action against coaches who probably induced these athletes to take the short-cut to success, the national body probably has left its doors open for more such use of banned substances in the future as well because no one can control human greed. And, secondly, by not punishing the 19 athletes who had tested positive in the Punjab National Games in 2001 it has allowed a section of athletes to get away scot-free, specially when there was talk of some of these athletes being “habitual offenders.” There are also reports that among the 21 tested positive at Hyderabad some of them had tested positive at the Punjab National Games also but then the IOA opted to keep a stoic silence both in the New Delhi press conference on Wednesday as also when the IOA Secretary-General met the media here last week. Most of the sportspersons who take to athletics are generally from poor or lower middle-class families. They in any case do not have access to top-level medical advice without which nobody can take performance enhancing drugs. And mind you one has to take these drugs over a prolonged period of time to get tangible results. 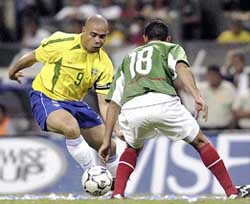 Together with steriod and stimulants, the sportsperson has also to take masking agents which only a doctor can monitor. This is where the role of the coach as also the doctor comes into sharp focus. But the IOA in its wisdom opted to turn a blind eye to this, although certain athletes have gone on record to say that it were their coaches who induced them to take performance enhancing substances. In their extreme desire to taste success and pick up money (which for most of the athletes is very substantial) which comes with victory at the highest level, specially in India, some of these budding athletes fall prey to coaches whose jobs sometimes are on the line if they cannot produce results. This is where the drug-induced performances begin. And once the athlete tastes success the coach’s day, as also his job, is made and his job is secure for some time. With testing facilities at a very primitive stage in India till now and the SAI lab in New Delhi yet to get the recognition of the International Olympic Committee (and the IOA Secretary-General in his recent visit in Chandigarh has gone on record to say the association did not have the kinds of funds required to conduct dope testing at all levels across the country) it is only at events like the National Games where these sportspersons have a chance of getting caught. Coming to the positive cases which were detected at the Punjab National Games the IOA has treated the whole affair in a cavalier fashion. Otherwise, should the IOA President say that “no proper record of the dope test results were maintained” ? The positive cases in Punjab were pointers in the wind which the IOA should have taken a very serious note of. So what is the way out? For one the government would have to release more funds to the IOA to conduct testing for banned substances wherever and whenever sports meets are held, be they be inter-school, inter-varsity or inter-state meets. Secondly, coaches and doctors associated with sports, be it at the district or state level or at the national level, should be told in no uncertain terms that if any of their wards were caught using banned substances their job too would be on the chopping block if it were proved that they were in any way responsible for the athletes using these banned substances. Also, the federations too have to keep a keen eye on the use of drugs since one drug cheat can tar the image of the whole nation if caught at any international meet. Only hard and tough measures can help to eradicate the menace of drugs in sports in India and the quicker they are taken the better it will be for Indian sports. In the opening match of the Ist Major Jagpal Memorial Junior Inter-Public School Basketball Tournament for boys and girls, the hosts, Pinegrove School lost a keenly contested match to Lawrence School, Sanawar, by 5 points. Ashish Kumar of Pinegrove scored 11 points while R.V. Chimni of Lawrence School scored 21 points. Sanawar won 34-39. Mr Derek Mountford, Officiating Headmaster, Lawrence School, Sanawar, was the chief guest at the opening session of the tournament. In the second league match, Lawrence School girls defeated Pinegrove School by 14 points. Eshana of Lawrence School scored 8 points. In another exciting match of boys section, Military School, Chail, beat YPS, Patiala in a keen contest. The final score was 33-30. Navneet scored 9 points for YPS, Patiala, and Rupesh Kumar scored 10 points for Military School, Chail. In a close encounter of the day BCS, Shimla, beat Shimla Public School 35-23. Hitesh of BCS scored 10 points and Baldev of Shimla Public School scored 9 points. In the fifth match of the day Punjab Public School, Nabha, beat Sanawarian girls by 32-16. The Haryana eves put up 171 runs for the loss of eight wickets in 40 overs. Anju Sharma scored 23 runs, Rohini 26, Deepti Bhatia 15 and Reena 14. In reply, Jharkhand were bundled out for 89 runs in 28 overs. Nanuta of Jharkhand claimed three wickets for 38 runs. Shashi was declared player of the match for scoring 13 runs and claiming two wickets. The championship is being organised for the first time in Panchkula, by the Haryana State Women’s Cricket Association. Ten teams comprising nearly 200 players and officials from all over the country are participating in this event. The teams Andhra Pradesh, Uttar Pardesh, Punjab, West Bengal, Maharashtra, Karnataka, Jharkhand, Mumbai, Madhya Pradesh and Haryana. Ms Amar Kulwant Singh apprised the Governor of the activities of the association. She said the association had been in existence for more than two decades. Its aim was to encourage women cricketers to join coaching centres and improve their cricketing skills. The association gave training to women cricketers throughout the year, she said. Ms Bhaswati Chatterjee of the association said nine matches would be played in this tournament at four venues in Panchkula district — Cricket Stadiums in Sectors 3 and 5, Satluj Public School of Panchkula and JR Institute at Barwala. The 53rd Punjab State Basketball Championship for junior boys and girls will played from May 2 to May 5 here. The following have been selected to represent the host city. Girls: Jagroop Kaur, Rajpreet Kaur, Geetu, Harbir Kaur, Harsimrat Kaur, Ruminder Kaur, Manpreet Kaur, Manisha, Neelam, Rajani, Kanwaljit Kaur and Randeep Kaur. Boys: Sukhpreet Singh, Gutinder Singh, Manpreet Singh, Navdeep Singh, Amandeep Singh, Gurbez Singh, Rawinder Singh, Pradeep Kumar, Yadwinder Singh, Jaspal Singh, Randeep Singh and Simranbir Singh.